We are entering the holiday season in a few days, a season for joy, peace and relaxation. If we turn on the latest christmas movie, we get this impression how a perfect holiday is supposed to be. Everybody in the family is supposed to be there, there is supposed to be enough food for everybody and everybody gets along. But is this reality for most of us? When I was a child my christmas holidays were filled with anxiety and fear. i had emotional abusive parents, and they struggled with different kinds of physical sickness as well. So if i was lucky it was a peaceful christmas because my father was in a good mood, and nobody got sick. But most of the time he was in a bad mood, and somebody was throwing up in the bathroom because of stress and migraine attacks. After I married my wife and I overspent our money and we are struggling with the consequences. This has of course given us many a christmas were we had good reason to be worried if we would make it financially until the next paycheck in January. I got saved in 2001, so as a child I had no conscious knowledge of our Lord Jesus Christ as Savior. But I knew who He was, and my grandmother had learned me to pray. So even though I had not made a decision for Christ yet, I still prayed. And that gave me a lot of comfort when my father got in a bad mood, and somebody got sick. When I got married in 2010 I had been saved for 9 years. And I can honestly say I would not have made it through this financial ordeal without my trust in Jesus as my Lord and Savior. He has always come through for me, when I was a child and now that I am an adult. Contrary to most popular preaching today He has never removed the ordeal I have been through. Instead His rod and staff has comforted me in the shadow of the valley of death. And when I have passed through it, I have come out to the other side and seen I have truly been brought to rivers of life and a green pasture where I could rest. So I know there are many out there who are not looking forward to this christmas. Some of you would rather go to bed and wake up in January then have to go through the next weeks and days. And some of you are truly blessed this season, you have nothing to fear right now. But you can never know what might happen later on. I can personally testify to this, if you choose to trust in what Jesus did for you you will have no reason to fear. If you are right now walking through the shadow of the valley of death, He will be there to comfort you with His rod and His staff. If you are right now headed for the valley of the shadow of death, without knowing it. He will be there waiting for you to comfort you with His rod and staff. And when you have passed through, He will set a table before your enemies and anoint your head with oil. But this will only happen if you make the decision to walk by faith and not by sight. If you make the decision to look not to the circumstances but instead look to the Cross of Christ. Your relationship with Christ is based on trust. He knows we cant be trusted anyway, so He is only asking us to trust Him and He will do the rest. But if we choose to trust Him He will move heaven and earth on our behalf, and Deut 28:1-13 will become a reality in our life. So I dont know what you are facing right now. But I know there are some out there who is hurting real bad right now. And I know there are some of you, you are walking straight towards the valley of the shadow of death because of choices you have made, and you are not aware of it. You keep on doing the same choices and suddenly you will sometime during this christmas find yourself in the dark valley. No matter what you are facing, no matter what has brought you into the valley, never forget this one important truth. 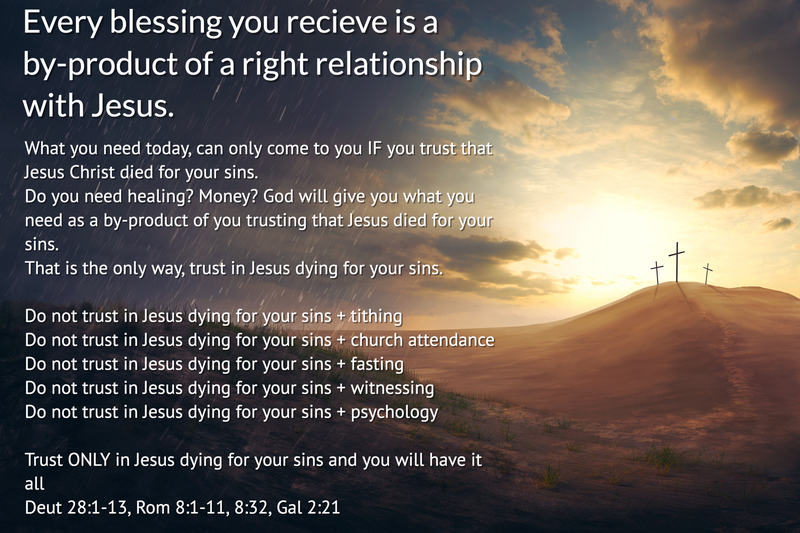 If you trust that Jesus died for your sins He will forgive you for all that you have done. If the mess you are in right now has happened because of your own stupidity and sin, He will forgive that and take care of the consequences at the same time. He will clean up your mess, the mess you made. The only thing you have to do is to trust Him, to trust that He died for your sins. That one decision to trust Him and His death on your behalf is the best Christmas present you can give yourself.